As much as I love cooking and eating in my kitchen, I honestly hate cleaning up. I mean there’s lots of dishes in the sink, leftover food on the table, and dirt that builds up over time. And it’s not just an eyesore but it can be hard to clean up too. And even if you’re someone who regularly puts an effort into cleaning your kitchen, it can feel overwhelming. 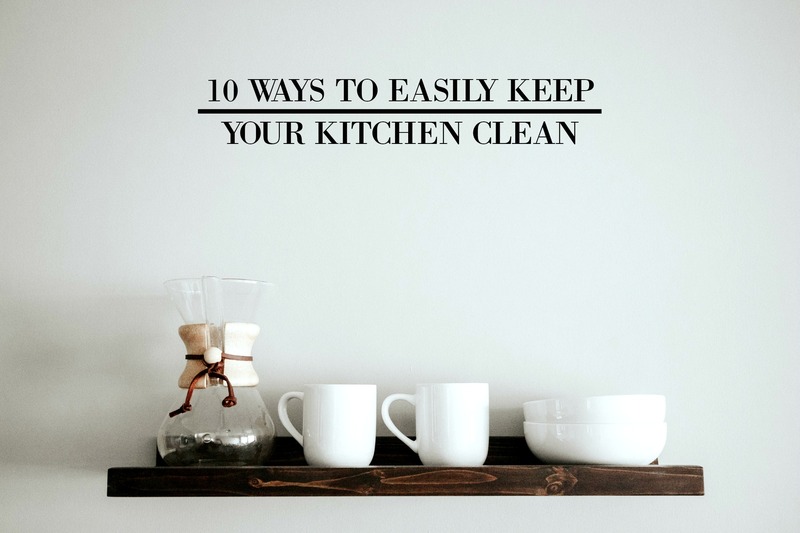 So to help make things easier, I’ve gathered some of the best cleaning tips for your kitchen. They’re easy to do and will make your kitchen look great in no time. So check them out and let me know what you think! We’ve all got those pots and pans that aren’t as shiny as they used to be. But instead of replacing them, make them look like new again! Create a mixture of baking soda, hydrogen peroxide, and liquid dishsoap. Spread it all over your pot or pan and leave all the work to the cleaner. Scrub until it looks brand new and shiny again. Do this tip also for your baking sheets and other metal cookware and you’ll be thankful. Your dishwasher cleans your dishes everyday, so it does make sense to clean it out as well. And to make this task easy, use lemonade Kool-Aid instead of a detergent cleaner. Fill your empty dishwasher’s detergent compartment with lemon Kool-Aid and run a normal cycle. The citric acid will help remove buildup and sanitize your appliance. This tip is the best solution for cleaning your dirty steel sink without using harsh chemical cleaners. All you have to do is sprinkle a light amount of baking soda all over your sink, especially with the corners and drain. Get an old toothbrush, run tap water, and scrub in circles. That’s it! You’ll have a shiny stainless steel sink in minutes. Of course, don’t forget to de-stink your sink as well. Do this by putting a lemon half in your garbage disposal and run water. The fruit will help clean and deodorize your drain. Microwave some water with lemon juice for three minutes, then let it sit for another five minute. This will loosen stuck-on residue inside the microwave and make it easier for you to wipe off using a wet sponge or microfiber cloth. With overtime use, your toaster can build up gunk, crumbs, and dirt. So to easily clean your toaster, use a small pastry brush to get crumbs out of the slots, then clean the removable tray. If your toaster does not have this, you can also turn your toaster upside down and give it a good shake. Sprinkle coarse salt all over your board and squeeze the lemon juice over it. Use your squeezed lemon as a brush and do the scrubbing work. Rinse and dry afterwards. Your kitchen cabinet can get dirt and stains with overtime use. To keep it clean and nice looking, make a salt and vinegar paste. Apply the mixture to the troubled area and let it sit for a few minutes. Scrub using a soft bristled toothbrush and rinse the paste off afterwards. Be careful not to scrub too hard, as you could scratch the wood. Soak your rusty knives in concentrated lemon juice and let it sit for a few minutes. Wipe off with a cloth, and you’ll have new looking knives again. Finally, after you’ve cleaned your countertops, cabinets, and sink, it’s now time to do your floor. I highly suggest you sweep your floor daily to get rid of all the dirt, litter, and dust that accumulates, then steam mop it at least twice a week to sanitize. And don’t forget to hit the corners where dirt can easily hide. Now, If you’re someone who has a love/hate relation with kitchen cleaning, I hope I was able to give some practical solutions. So give them a try the next time you clean and let me know what you think! Now, tell me if you have any hacks yourself, I’d love to hear about them!